Dealing with Disruptions in Your Routine. How to deal with disruptions in your baby’s routine. How to handle disruptions and adjust the schedule for baby. In light of the holidays and the craziness it brings, I thought this would be a good post to get up ASAP. Disruptions come in all shapes and sizes. 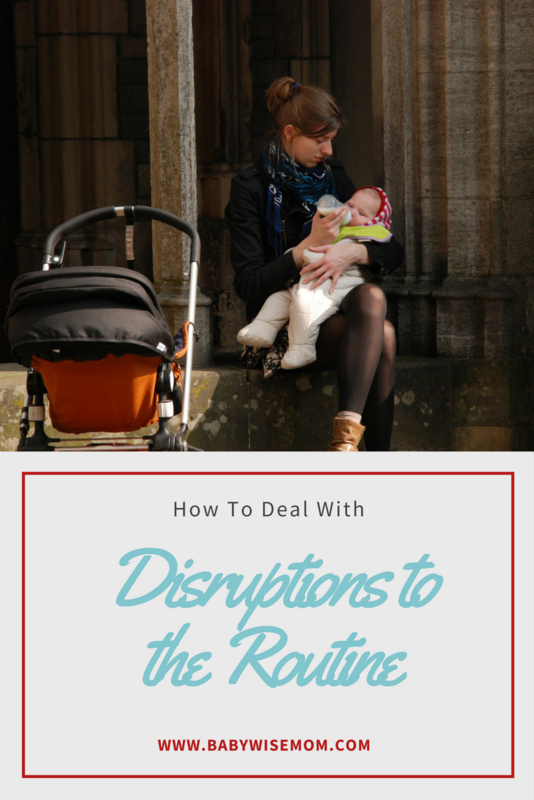 Teething, sickness, travel, visitors, errands…here are some tips in dealing with the disruptions when they come (and they will). One is just to realize that the baby is going to get off schedule. Some things are unavoidable. An example for us is church. We have church for 3 hours. I know that Monday will be harder all around since there was a nap missed. This is not negotiable for us–church is important. So we deal with it and it, accept it, and all is well. Do try to limit disruptions until baby is more in the swing of things. If you dedicate the time to getting your baby solid in a schedule before you start throwing disruptions at him, he will bounce back much faster after the disruptions. Usually 8 weeks is sufficient. Older babies may need less time. When you do have to be out and about (whether for church, errands, or for your sanity), just try to stick to the routine as much as possible. Try to get those errands in during waketime. Or some babies will nap on the go. Try to stick to the routine. As far as sickness and teething go, if you do train your child to sleep on their own, these should be pretty much non-issues. My two year old sleeps just as well and on schedule even when he is sick or teething or in a strange place. Kaitlyn is the same way. She even started sleeping later in the morning during a bad cold. Some naps will be disrupted. Oh well. There is a reason for it and the reason won’t last forever. Move on with the day. For vacations, some babies will wake in the night if they are in a strange place. If you are somewhere people can hear you, feed your baby rather than letting them cry and wake the household up. You can get back on schedule when you get home. It might take a few days, but the baby will bounce back. Follow guidelines in BW for visitors, adding your own judgment. If the person is there for one day and only a few hours, let them disrupt (if you want to). If they are there for several days, they can get their fix during wake times. See the Let Your Schedule Serve You post. Val,I can’t remember where on your blog you talk about your Sunday morning routine. I know Kaitlyn misses her morning nap, but I can’t remember how you compensated for it. My son eats at 7/10/1 and probably shifting to 3 1/2 hour schedule soon. His 1st nap gets cut 30 min short (1 hour if we do 3.5 schedule) so we can get to church at 10am. Today I was able to get him to fall asleep in his car seat for 45 min around 12:15pm. I fed him and put him down at his next regular nap time after that. Do you have any tips for how to compensate for his missed naps? He’s 4 months. My biggest concern is that he is in daycare so I try really hard dto be consistent on the weekends. I hate for him to miss any naps or not stay on schedule on the weekend but need to figure out how to fit his schedule around church. Thanks!! I can’t remember either…it is probably just mentioned in several posts :)The way I compensated has evolved as she has gotten older. Once she was at an age where a nap was dropped, I would just give her an extra nap. So she would have an evening nap when she usually didn’t. I also put her down early for the next coming nap. Since your son’s nap isn’t totally gone, you could either add a short nap, extend the afternoon nap, or put him to bed early.Right now, she misses her morning nap completely. We get out at 12. She eats lunch then goes straight down, which is usually somewhere around 12:45. Her nap usually starts around 1:45 these days. She then naps until her normal wake up time. We then put her down a little early for bed, perhaps 30 minutes. In your opinion, do you think skipping/shortening his first two naps on Sunday will be a problem/mess up his week since I can only guarantee good naps on weekends since he’s in daycare? It honestly is a possibility. I know Monday is a catch up day for Kaitlyn, despite the extra sleeping on Sunday. It really is a difficult situation. For me, I would still go to church. You will have to decide your value system and decide what you want to do. It will be shortlived; as he gets older, he will be more flexible and can miss sleep easier. You will have to see how he reacts. Good luck in figuring it out. My son is five months and has his bottom teething coming through. This has really disrupted his naps. Not his night time sleep though. Any suggestions on how to get him to sleep through the naps while in pain like he does at night? I have tried letting him cio and shortened wake times. He is sleeping one hour in the morning, 1 1/2 hours in the afternoon, and 1 hour for the evening nap. Is that enough? I have a 12 week old and have been doing BW since day one. It has been great, she started sleeping from 10:30 to about 7:30ish…until now. Our typical feeding schedule is 8:00, 11:00am, 2:00pm, 5:00pm, 8:00pm and 10:00pm. We went on vacation last week and now she is waking up at all hours of the night! Last night she was up at 2:30, I let her CIO for 45 minutes until she went back to sleep, but was up again at 4:00. I finally fed her just to get some sleep myself. What do I do? Also, when do I know to drop a nap? She takes a shorter nap after her 5:00pm feeding (typically from 6ish to 7ish) and often won’t sleep after her 8:00 feeding until her 10:00. Thanks! I might try dropping that nap after 5 to get her to bed before 10. Next Post Poll Results: What Age Did Your Baby Move to a Four Hour Schedule? Hi there!So I went on vacation to visit/ show off the new baby to my husbands family. Well the trip was awful. My son did pretty well with all things considering, but he had trouble with his naps. Basically my mother in law completely critized my parenting the whole trip. Saying things like “She won’t drive back with her husband (13 hours), but she’ll let her baby scream for hours. She just leaves him on the bed and walks away” I have never done any of the above. He fussed, not cried for like 20 minutes when he would wake up halfway through his nap. And sometimes in the morning because both of his bottom teeth are coming in at the same time. But I was totally consoling him. Does anyone else feel like they have to justify them selves to everyone? I know that this is what works for my son. So why does it seem so awful to outsiders? My husband and I have talked about that. It is strange that people can be so critical. I think some people criticize because they don’t want to have to work around the needs of the baby, but rather want baby to work around them. Some people feel insecure about what they are doing and feel the need to go out and attack those who are doing things differently to try to make themselves feel better. It sounds like your mother in law has other bitterness about things and is just critical in general. I wouldn’t really justify yourself. I would just basically say that you are doing what you know to be best for your son, just as you are sure they are doing (or did) what they know to be best for their child. I wouldn’t defend and I wouldn’t explain. I think anyone who is openly critical of another peron’s parenting skills isn’t looking for an education, you know? FirecrackerI totally understand what you mean about having to justify yourself about how you are doing things. I feel the same way. I’m just way too paranoid about what other people think about me. It’s stupid, and I’m working on it, but that is just how I am. My mother in law can’t stand to have a baby even make a sound for 1 second without responding to it. So, when I’m at her house I sometimes do things a little different than I normally would. Because my son is so used to how things normally are, it doesn’t make any difference. The same thing goes for church. I hold my son there the entire time he is sleeping. He just won’t sleep any other way. It doesn’t disrupt him at all. Also, I wanted to mention that as my mother in law has spent more time with me and baby and seen how I know when he is tiredand hungry, and that I’m able to keep him so happy, I can tell that she is now much more accepting of how I do things. In fact, she often comments to her daughter who has three children that her youngest is ready for bed, needs to eat etc and she has NEVER done that to me the last few months (and she is not one to hold back saying anything, even if I am just her daughter IN LAW). I have a question about a more extended disruption in routine… I came down with the stomach flu on Saturday, and my husband had to bottle feed our 3 month old formula for me. Because of the medication the dr. gave me, I had to formula feed Sunday and Monday as well, and I pumped to ensure my supply stayed up and that the medication was not stored in my milk. Last night she woke twice to eat, when before she was sleeping through the night. Anyone have an experience with this before? Is my milk supply that low now? Or is it the switch back to breast milk from formula? That is no fun when you get sick! You are at a growth spurt age. If she hasn’t had a 3 month growth spurt yet, then she could be in one. It is also possible that your milk supply has dropped. Pumps just aren’t as efficient as baby 🙁 You could try increasing your number of feedings in the day to see if that helps it. Hi Valerie,Thank you for publishing this blog! I recently started trying to get my 3-week-old on a babywise routine. It is going ok. He nurses only 7 times a day (7/10/1/4/7/10/3am-ish), but he is a big boy and his output is great. I am trying to get him on a 3-hour routine during the day, but with two older kids I am struggling. He won’t take a full feeding if I nurse more frequently than every 3 hours. He also sometimes wakes up from naps before a feed time. What do you recommend then? It gets the whole schedule off because if I feed him he won’t take a full feeding, but if I wait, he’ll probably fall asleep nursing. How do I figure out the schedule when I need to take my 5-year-old to preschool and pick him up twice a week? The times we are gone from home are in the middle of a naptime (8:40-9:15 and 11:40-12:15).Thank you! Waking Early From Naps/Won’t Fall Asleep For Naps: http://babywisemom.blogspot.com/2008/01/waking-early-from-napswont-fall-asleep.htmlFor preschool thing, I would either try to shift the schedule every day to work for that, or just realize that disruptions are going to happen twice a week and accept it and work with it the best you can. firecracker, I know your posted your comment about being sick a LONG time ago, and I dont know if youll ever read this but I wanted to give some information to help others in the future! The same thing happened to me around baby’s 3 months (I got the stomach flu AND my baby went through a growth spurt at the same time) and therefore started waking during the night. My lactation consultant recommended Fenugreek, its an herb and it helps increase the prolactin in breastfeeding women. My milk supply remained low for a couple of days but as soon as I started pumping AND taking fenugreek it boosted within 24 hrs. It was back to where it used to be and MORE within 3 days. It took baby about a week to start sleeping through the night again, bc the waking had become habit (from me feeding her during night wakes for 3 days…but I knew she was hungry, until she stopped eating as much). But things got back to normal after we stopped feeding her in the middle of the night for about 3-5 days. I hope this info helps someone like it did me! Thanks for the info KJackson! I have heard a lot of mothers take fenugreek. I appreciate this post. My daughter (5 months) currently has RSV, which has disrupted our schedule, but before that we were on the east coast (3 hour time difference) for 2.5 weeks. She was already off schedule because of our trip, then to come home and get RSV, I am worried about ever getting back on our great routine. She is all messed up right now, but when she is sick, I can’t make her CIO because she already feels terrible. I am so concerned about it. I am hoping we can bounce back, although I’m not so sure since it has been so long. She used to sleep 11.5 hours per night and we were just ready to move to a 4 hour schedule, things were great, very little crying at naps and an overall happy baby. Now…well, it just isn’t that way! I miss her. Do you have any advice on traveling and adjusting to a new time zone? We will be traveling back to the US from Europe in August when baby is 1 year old – we will first hit the east coast, which is a 6 hour time change, then the west coast, for another 3 hour change – I’m dreading it! I’m thinking of gradually shifting his wake up and bed time while we are still here, maybe working up to a 3 hour change – thus, making the trip a bit easier. Do you have any suggestions? Melissa, I would dread that also. See the post that is posted today (3/2) on the time change. All of the strategies for time change can be applied to time zone changes. I think it seems most babies do okay with a huge time difference like that. I also suggest you click on the blog label “traveling.” There are readers who have moved large distances and put there own tips in there, so be sure to see their comments. No one has posted here in a long time so I hope this gets read! Been doing BW with my 9 week old since day 1. She sleeps through the night, just since last week. My question is in regard to going to church, Bible study and other activities in the day that we will be doing in the fall. By August, she will be probably on a 4 hour schedule. What do you recommend I do for the morning nap on church day and two other days we have things to go to in the morning? I am guessing she will eat at 7am and nap from about 8:30-10 and need to eat again. Each of the activities are from 9-11 or 9-12. The people who will be caring for her won't necessarily try to help her nap when I drop her off at 9. Do I just let her miss the morning nap or have a short one and then give her a nap right after she eats again at 11? I hope that all made sense!! Thanks! In regards to my post above, these are the days I am concerned about: Sunday: church 9-12, Tuesday: Story Time at Library 10:30-10:50, Wednesdays: Bible Study leaders' meeting 9-11, Thursdays Bible Study 9-11Is that too much disruption? She will be seven months when we start this schedule. Thanks!